Nagato thinks to control naruto but it isn’t so. Konan: Even if he’s so close he rejected nagato’s chakra. What a guy! 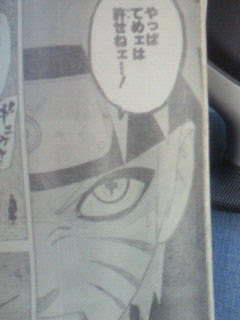 Naruto sais that it was planned and his eyes start mixing frog style’s eyes and kyuubi style’s eyes. Naruto: i cant forgive you, now let’s finish that. And he attacks Nagato but then he stops and he asks Nagato about his past. During the ninja war my family escaped. we hid into an house but 2ninja came in looking for food. Nagato’s mother told him to stay hide. Then his parents attacked ninja and they were killed by enemies. right that moment a storm started outisde. the ninjutsu it’s from a konoha ninja. Nagato: Yes, kyuubi, I am the real one. Panels of Yahiko. Nagato thinking about him. Nagato: I will accept my death. Naruto: I am not here to kill you, I only want to talk. Nagato: I will answer any questions, but first tell me if you have found the answer to peace. Naruto: And it is different from yours. Nagato: Please tell me how I am mistaken. Naruto: You are right to seek power for peace. But you seek the wrong power. Destruction and pain will never bring peace. It will never stop hatred. Flashbacks of moments of hatred that Naruto has seen. Naruto: Hatred has only fueled ninjas to seek greater powers of destruction. Naruto: But the greatest power in this world isn’t to destroy. Naruto: It is to forgive. To forgive and accept your enemy is the way to peace. Nagato, astonished, jerks (like trying to get out of a chair or something similar, hard to explain) then starts coughing blood. Konan passionately, with concern: Nagato! Naruto: Now tell me about the masked one, Akatsuki’s true leader. Nagato fires a black rod from his wheelchair. Naruto takes it to his stomach. 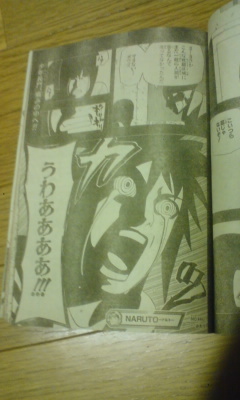 He then sees Jiraiya’s death and how Kakashi died from Nagato. Nagato[Thoughts? ]: I try to manipulate Naruto and take him back, but Naruto is resisting the black rod. Konan: To repel Nagato’s chakra at this range, what a kid. Naruto: I can’t forgive you, I want to kill you right now! But he stops just before him. Naruto: I don’t know anything about you, why do you hate [Konoha]? At the height of the Great Ninja War, we had been too late at escaping, so we were hiding at our family’s house. Two ninjas came into our house. Nagato’s parents: Nagato, you need to hide. They kill his parents instantly. The ninja: There’s one more around here. @admin: could be, well lets leave it at ‘unconfirmed’ for now. @colonel sanders : spoiler from edgarlutivg taken from the http://powermanga.forumcommunity.net/?t=21082756&st=0#lastpost with Verification: pending..
Naruto’s eyes turn into frog + Kyuubi eyes. I don’t believe sanders is even close. Ive seen this one several times but it doesnt add up. They made a huge deal with jiraiya seeing the rinnengahn first. Not at all! You are welcome!